Etch your own ornaments this year! And they can be used for either abrasive etching or with etching cream. 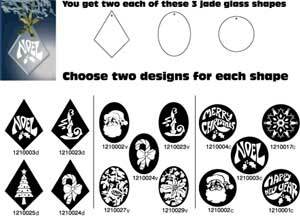 Make sure you select ONLY TWO stencil designs for EACH SHAPE (There are 3 shapes). You should have a total of 6 designs selected! Please make sure you select properly, otherwise your order will be delayed!